“The destruction was minimal” said the air attaché for the American Embassy in Cambodia. Colonel H.E. Opfer described how he saw one lot of bombs go through the town of Neak Luong “but it was no great disaster”. Neak Luong, Cambodia, August 1973. The Americans are firmly ensconced in a campaign of bombing and denial and this particular month was one of their worst. In what proved to be the third bombing ‘mistake’ in as many days, the town, which lies on the east side of the Mekong River was devastated by a lone B-52 bomber carrying over twenty tonnes of explosives. The bombs ripped through the centre of the town killing 137 and injuring at least 268 more. A good deal more than the total casualty figure first given by the Americans of 150 which they were forced to retract. One American reporter who interviewed a forty eight year old soldier described how his wife and ten of his children had been killed, leaving an eight month old baby for him to raise alone. It would be one of many tragically similar stories which gets lost in the fog of war and fading memories. The bombs took out buildings, shops and damaged the hospital, killing and injuring patients and staff, it was a scene of absolute carnage and despite it Col. Opfer insisted there was little more than a few structural cracks. To this day it beggars belief. There was no proof of enemy activity in the area and yet the Americans unleashed a grossly over-zealous attack which they tried to cover up. Neak Luong became another innocent town flattened and left to its own devices with no means in which to repair and rebuild. What is often forgotten about conflicts are the years of hardship which ensue a people whose homes and means of income have been obliterated in seconds. 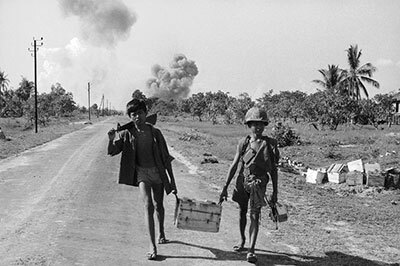 Cambodia’s natural resources were scorched almost beyond help whilst the psychological damage and dangers of unexploded bombs remains to this day. Will Eric Clapton Vote UKIP?